In the last issue we got as far as preparing all the boards ready for assembly, including belt and coarse random orbital sanding them. The next step is to mark out the positions for the shelves and divider very carefully as this then allows you to mark the positions for the knock-down (KD) fittings. The positions are governed by, and indeed marked off, the already sized components. 1 Mark both sides of each shelf and the divider position on the end panels, the middle shelf and the underside of the top rails. 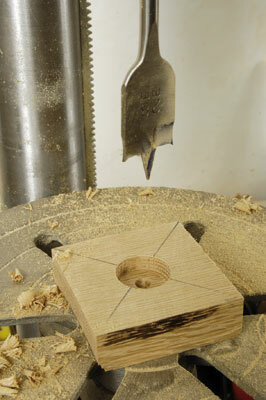 Having done this it is now possible to devise a suitable jig for drilling the barrel nut holes. 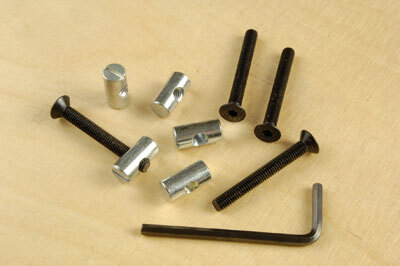 Barrel nuts come in different lengths and are 10mm in diameter. I chose 20mm long as the finished boards were 22mm thick so ought not to project from either side if centred correctly. 2 I made a jig from thin MDF with the barrel nut hole positions marked on it - the jig being wide enough to mark two holes at a time - then moved across for the other two. At the other end of the jig are closely spaced holes for the top rails. 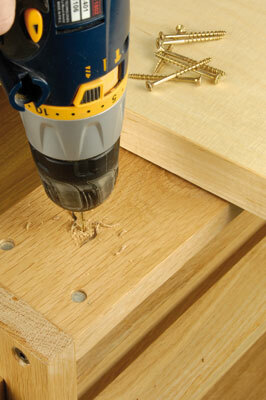 Using a 10mm brad-point drill, drill accurately through the jig exactly where the hole positions are marked. Clamp a board underneath each drilled position to avoid breakout. In fact the barrel nuts are quite a tight fit and will need to be tapped home without marking and the screw slot turned so the threaded holes are perpendicular with the board ends. 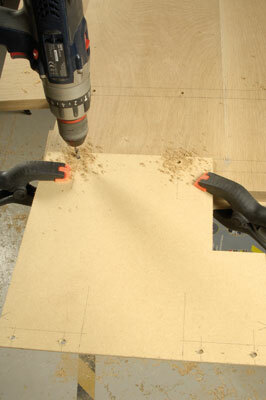 Bearing in mind that you only need to make 24 joints, an MDF jig is adequate, but care is needed to avoid opening out the jig holes and allowing inaccuracy to set in the more it is used. The next task is to use this same jig to mark the corresponding holes for the countersunk bolts which form the other part of each joint. 3 The face drillings can be done simply by aiming the drill point exactly on each cross marking, but end-grain holes need a simple jig that hooks over and is clamped in place. 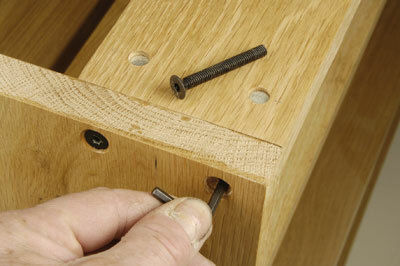 4 The jig must be drilled with care to ensure the holes are centred and perpendicular. 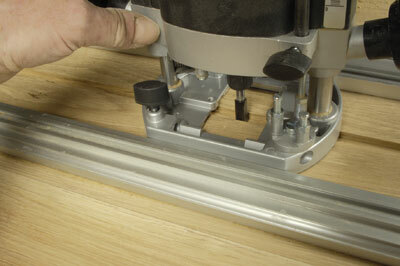 To be honest, if you have a decent dowel jig available then use that as it is more reliable. In theory, as the bolts are M6 threads, a 6mm hole should suffice but experience told me that a degree of sloppiness with such a home-made means of drilling was required in order to ensure that all fittings would line up adequately. 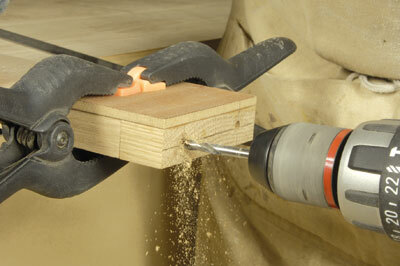 Therefore I chose a 7mm brad-point bit instead, which gave a suitable amount of leeway. Drill through into each barrel nut hole and slightly beyond to suit bolt length. 5 One end panel, divider and the mid shelf need a slot for the centre panel. This is machined with a router and a bit that suits your chosen board thickness. A 6mm board is best but I used 12mm oak-faced MDF as I had it in stock. 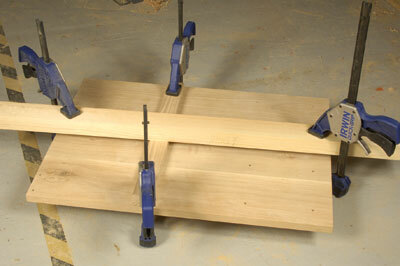 Two board clamps or two straight battens are used to guide the router and can be opened apart a bit to widen the slot if necessary. 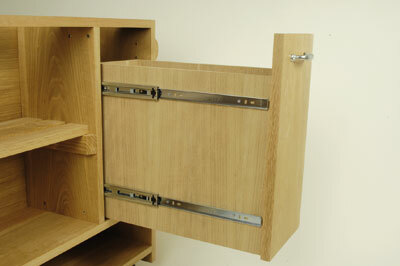 6 The same end panel and divider hold the shelf slats. These need to be cut exactly to length. 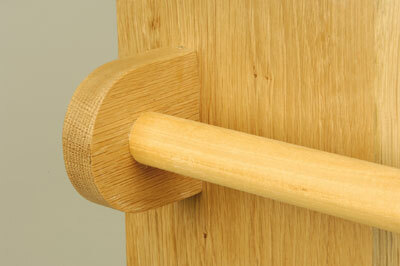 Two pieces of oak batten form the supports, with a gap down the middle for the centre board. Biscuit with No. 0s, glue and fit these in place, cramp and leave to dry. 7-8 Now mark the slat positions and biscuit into the top edge of the supports. 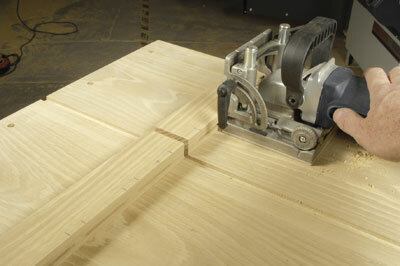 To make the opposing slots in the ends of the slats requires a simple jig to ensure that the slots are consistently at the right distance from the component ends. All carcass parts are now fine sanded ready for finishing before assembly. 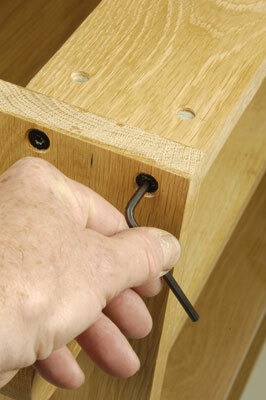 Tap the barrel nuts into their holes and adjust them using the screw slots so they line up with the bolt hole drillings. 9 Now start bolting the components together in no particular order. It can help to use the chosen Allen key first to push through into the bolt holes, thus ensuring they are lined up correctly. 10 Next, tighten each bolt until it is obvious the thread has caught and is winding in properly but don't do it fully as you need a bit of freeplay to get them all to line up. I only had one slight mis-drilling, for which a bit of jiggling was needed to get the bolt and nut to align properly. 11 For convenience it is better to fit the lock-down castors now, thus making it easier to manoeuvre this substantial unit around the workshop. 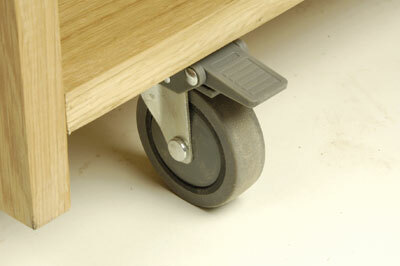 Ensure the wheel clears the end panels and overhangs outwards enough to expose the foot-operated lock levers. 12 The waste unit is made from 10mm oak-veneered MDF formed into a box joined with '0' biscuits. The sides overlap the back, front and bottom. This box needs plenty of finish applied to keep it water resistant and to avoid marking. Two pairs of triple extension side runners are needed to mount the box. These are normally 25mm thickness a pair so take this off the width dimension. 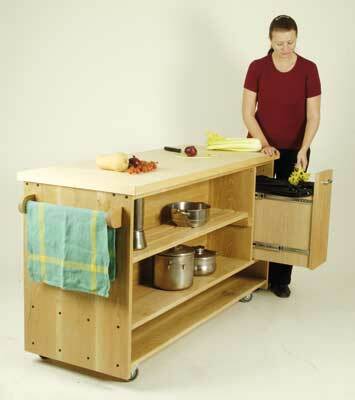 Leave enough space for a slightly recessed solid door panel and a back panel set into a rebate. 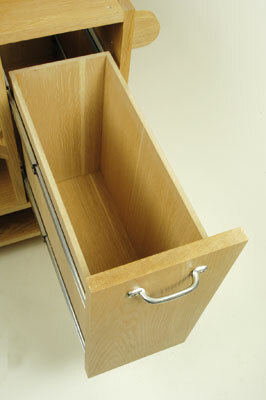 The drawer runners need to be 500mm in length. Originally I had intended this section would slide out either side but it proved to be too difficult to do in the time available. Once operational a black bin liner is needed before waste is put into it. 13 Set out the runners carefully before screwing them on with very short screws. Ensure the front panel has slight gapping all round, then drill holes for the handle above the height of the waste box, and fit the handle. Machine a rebate on the rear to take the back panel that covers the waste section, then glue and pin it in place. Note: if the adjoining surfaces are not level or the rebate cutter bearing fouls the runner ends, you will need to do a partial disassembly before machining. The towel rails need to be fitted on the end panels; 28mm obeche is about right and you need to cut and shape the ends that it will fit into. First cut 80mm squares and use diagonal pencil lines to mark where the holes should be. 14 a sharp 28mm spade bit on a drill press, setting the depth stop so the point of the bit doesn't break through on the underside of the wood. 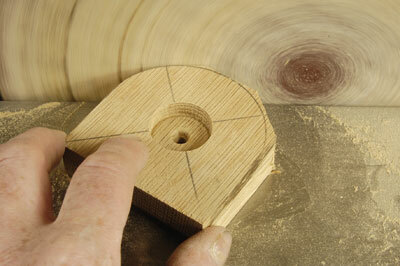 15 Now find a suitably radiused object to mark the half-round shape and rough cut outside the line. 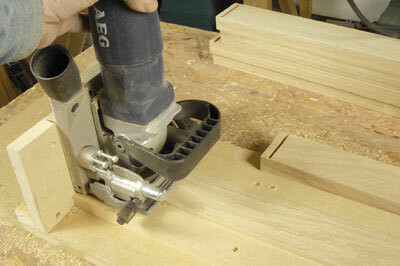 A disc sander is ideal for fine shaping if you have one. Work along the rough edges onto the pencil line, take the roughness off all edges and apply some finish. 16 Mark the carcass where these components will fit, drill from the outside of the carcass and countersink on the inside. At the waste end the countersinks aren't necessary as they won't show and space for countersinking is very limited. Drive the screws through so the tips show and push the end pieces on to them so they are marked for pilot-hole drilling. 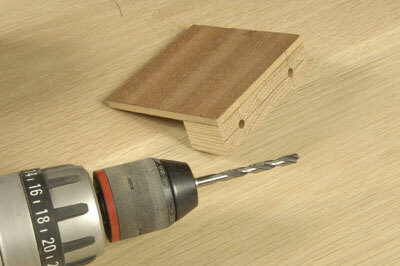 Drill and then screw them in place after cutting the dowel to size. 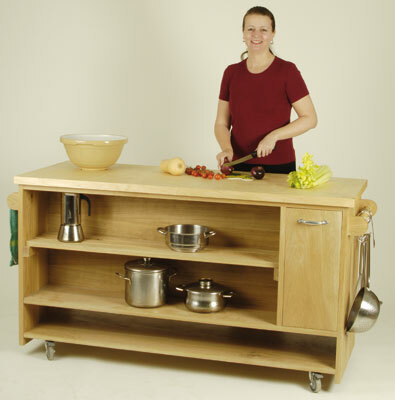 17 The worktop is standard F-jointed solid maple which can be ordered from good timber yards or kitchen outlets. Sand it to a fine finish, apply a food-safe oil coating and screw it onto the base from underneath through the top rail. "The barrel nuts are quite a tight fit and will need to be tapped home without marking"
If the runners aren't absolutely perpendicular to the carcass or box, the box won't sit properly or run smoothly. No easy operation, once it's achieved it’s very satisfying.